The best Abaqus suite of non-linear Finite Element Analysis and Computational Fluid Dynamics solvers. A single Abaqus environment for your pre- and post-processing, simplification and advanced meshing. An Implicit or Standard solver, an Explicit Solver, a CFD solver and many more capabilities. Peerless algorithms provide you with confidence to reach convergence for your contact analysis. Used by Simulation Specialists, and more and more by engineers to solve their specific non-linear challenges. Realistic Simulation with advanced multiphysics solutions. The interface enables you to set-up your own 2D or 3D geometry from scratch, or read in many common 3D files to perform your simulations on. Powerful solvers to find solutions for your simulation challenges. The Implicit, Explicit and CFD solver all available through one and the same interface. Peerless algoritms assure to have the most accurate, robust and reliable contact capabilities, to reach convergence for your contact analysis challenges. Powerful solvers and interface default available in one single type of software. Pre- and post-processing, simplification and advanced meshing. Virtual topology tools available to simply geometry to prevent unnecessary details and repair sliver faces or small gaps and imperfect surfaces. Apply free meshing, structured meshing, sweep meshing and bottom-up meshing, creating partitions and use of many tet and hex elements. Setting up your simulations, applying multi step approaches, and interpreting results with a powerful and user friendly interface. The implicit solver for non-linear static and low speed dynamic events. Simulations like static and dynamic stress/displacement, direct cyclic, low-cycle fatigue, creep, heat transfer, Acoustics, magnetics and multi-physics. Simulations like eigenvalue buckling, natural frequency, steady-state and transient modal dynamics and response spectrum. Many types of elements for specific analyses like shells, membranes, gaskets, continuum, trusses, cohesive and many other types of elements. The simulation started with Standard can be continued with Explicit which provides high flexibility for your convergence challenges. The explicit solver for fast transient dynamic events. Intended for high-speed transient dynamic events and also suited for highly nonlinear quasi-static events. Coupled Eularian Lagrangian for droptest filled with liquid, or Smoothed Particle Hydrodynamics for sloshing effects and bird strike impact analysis. Different elements like continuum elements, particle elements such as SPH and DEM and specific loadings like airblast, acoustic and amplitude curves. The simulation started with Explicit can be continued Standard which provides high flexibility for your convergence challenges. Simulate in-compressible fluid dynamics, transient and steady state, fluid and solid heat transfer, natural convection and laminar and turbulent flows. CFD comes standard with your SIMULIA license. 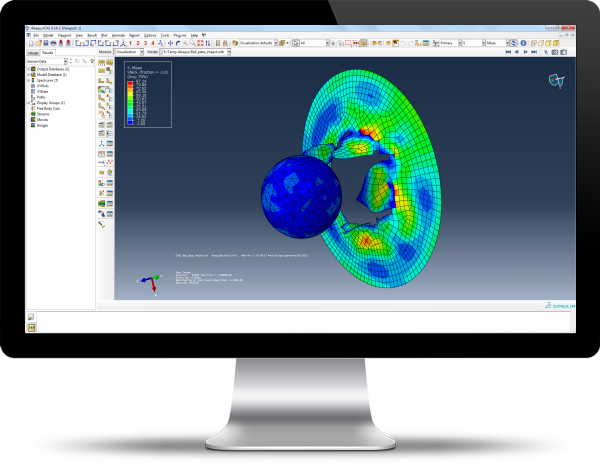 No need to leave the interface to setup your CFD analyses. The CFD solver can be used in combination with Standard or Explicit to perform co-simulation for fully coupled FSI Analysis. Purchase Abaqus, or choose for yearly or quarterly lease and add tokens during the contract to fulfill your Simulation needs. Use tokens to run on additional cores. If you are in a need for extra simulation power, just order additional tokens. The Abaqus pricing model not based on functionality, but on using X number of CPU & GPU Cores, and concurrent number of users. Use CATIA V5 Parts and Products in CAE. Materials and publications can be imported to the Abaqus model. file formats like .CATPart and .CATProduct files can be imported in CAE as well. Use SolidWorks parts and assemblies in Abaqus CAE. Change the model in SolidWorks and revisions are pushed to CAE without loss of analysis features which were applied earlier to the Abaqus model. Use Pro/ENGINEER parts and assemblies in Abaqus CAE. Includes a translator to export Pro/ENGINEER parts, assemblies and Elysium Neutral (.enf_abq) files. Features like radius, length or hole diameter can be changed in Abaqus and updated to Abaqus and the Pro/ENGINEER model.